A Guided Meditation to Enhance Healing, Well-being and Relaxation. 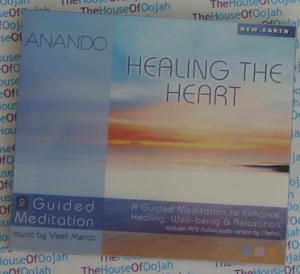 Healing the Heart is a guided meditation that gives you the opportunity to make a connection to your heart, to feel the space that is calm and peaceful, and to see how powerful and healing that energy is. This album will allow you to feel your heart as free, light, and flowing again. She is the founder of the international personal discovery organization, LifeTrainings.com, which is devoted to helping people realise their hidden potential and resources. Its courses show people how to bring more awareness into their lives, and how to start enjoying life to its fullest. Anando started her professional career as an actress at the age of 12 and later she studied modern dance at the Martha Graham’s London School of Contemporary Dance. With a complete change in career, she studied law in Australia and was admitted to practice as an attorney in both Australia and the USA.